For Kansas City-based Advanced Logistics Fulfillment, installment of a metal detection system was necessary to protect their assets as well as the assets of a recently acquired customer. Kenton Brothers provided Garrett Metal Detectors as a means of securing and protecting their facility. Advanced Logistics and Fulfillment is a packaging and fulfillment company working in an underground facility. While the facility itself is secure for their usual business needs, they recently brought on a new client whose packaging displays include an expensive electronic component. Kenton Brothers security wasted no time implementing a walk-through metal detector to prevent losses of these specialized components. 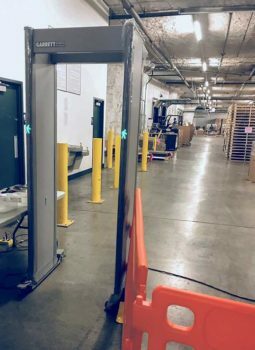 A Garrett PD6500i walk through metal detector was selected for its ability to allow for up to 33 target zones to pinpoint multiple target locations from head to toe on left, center or right sides of body. Walk-through and hand-held metal detectors are becoming an accepted form of security protection for venues of all kinds, including schools, universities, events, government buildings and businesses throughout the nation. Advanced Logistics and Fulfillment employees are able to get to and from work quickly and efficiently, thanks to the Garrett PD 6500i’s ability to target with greater accuracy, meaning fewer false alarms and higher throughput.